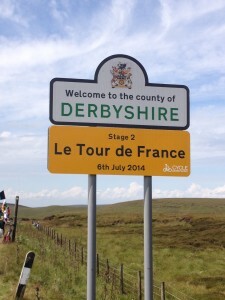 The two opening stages of the 2014 Tour de France based in Yorkshire got the race off to a superb start and has set a new standard for support of the event itself, for cycling both in the UK and more importantly in Yorkshire. The race Director, Christian Prudhomme, described the Grand Depart as the ”grandest” in the race’s 111 year history. An estimated 2.5 million people lined the route and it was quite clear, from both the scenes on the television, and from being there in person that Yorkshire got enthusiastically and passionately behind the event. 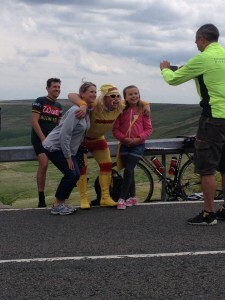 We opted to get onto the climb of the Cote de Holme Moss where the riders would be at their slowest and we weren’t disappointed in the slightest. The weather held, the 60,000 strong crowd were in great mood as were the Police and race officials. We opted to cycle there given the road closures and riding the traffic free roads of Huddersfield and Holmfirth towards Holme Moss was a novelty in itself. The crowds were out early and by the time we got to the climb itself, we realised that we certainly weren’t the first. Undaunted by the building masses, we cycled the climb itself up to the King of The Mountains finish at the top for a few photos and then picked a spot to watch the day unfold until the race arrived. Given the vantage point we had we soon spotted the TV helicopters that were following the race and we watched them weave around as the peloton approached. The two man brake came first which included Thomas Voeckler closely follow by the main bunch with Team Sky at the front. The crowd noise for deafening but it was a great spectacle. And then they were gone. There were two riders that had fell off the back that nearly got caught up as the crowds started to descend the climb but they soon parted to let them through. There were so many people up there that we had to walk the mile and a half off Holme Moss with our bikes before the crowed thinned enough to get cycling again. A fantastic day, great experience and hopefully something that will deliver a legacy for Yorkshire and for UK Cycling.